tantek GWG, how is the morning of June 23rd in Portland for a half day leaders summit for you like we did last year? GWG I enjoyed it a lot last year. [eddie] aaronpk: do you use anything like Runkeeper for your exercise or is that manual tracking? [cleverdevil] Hooray for finishing experiments! martymcguire[m] [cleverdevil]++ congrats on the /watch implementation! Nice work making it a Known plugin, as well! [jeremycherfas] Anyone know whether Woodwind can import an OPML file, and if so how? [jeremycherfas] ben_thatmustbeme I suspect you would spend all you time maintining it. ben_thatmustbeme what is indieweb network? Loqi It looks like we don't have a page for "indieweb network" yet. Would you like to create it? voxpelli miklb: OPML one-time imports or continuous imports? [jeremycherfas] Not quite ready for NextCloud ? aaronpk What's the difference between single user and multi user? ben_thatmustbeme maybe native indieweb vs non-native? voxpelli ben_thatmustbeme: ^ maybe link to that in regards to eg. Mastodon and such? voxpelli not sure what software to add to the single user section? should we add WordPress, Jekyll etc there? voxpelli ben_thatmustbeme: would you be okay with rephrasing that page to be a list of IndieWeb friendly silos and platforms? Loqi It looks like we don't have a page for "application" yet. Would you like to create it? [kevinmarks] do we want a list of things that have refused mf2 PR's ? KartikPrabhu [kevinmarks]: negative framing ? aaronpk also...add jekyll and wordpress to the table? 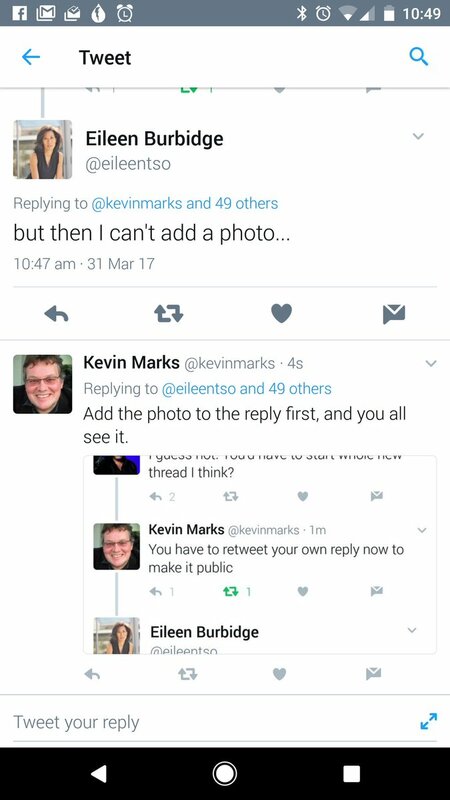 [kevinmarks] maybe I need a post? [cleverdevil] Good morning, IndieWeb ? [cleverdevil] So, @voxpelli and miklb, Nextcloud News has a REST API that allows you to add, delete, move, and refresh feeds at will. You could pretty easily use this to do OMPL syncs like you mentioned earlier. [cleverdevil] Discussed Indieweb in detail, and how we could make Nextcloud play nicely with Micropub, Webmention, and Indieauth (amongst other ideas). [cleverdevil] (He mentioned that he knows @tantak from his time in the w3c). [eddie] That’s awesome! Was he receptive? [cleverdevil] Yes, very very receptive. [cleverdevil] We are going to set up a weekly call to discuss how to work together. [cleverdevil] Oh well, that's a shame ? [eddie] It really is ? ben_thatmustbeme what do you mean? tantek ben_thatmustbeme: FWIW I'd say keep the "_networks" list on the SWWG wiki focused on the same kinds of things that the ActivityPub_ equivalent page does. It's ok that that SWWG *_networks page is a subset of things that support indieweb friendly protocols and such. tantek also agree with KartikPrabhu's rhetorical question, no need to add things as "refused", because that's pessimistic, whereas it's better to frame as "not yet"
GWG ben_thatmustbe: I am trying to come up with an array of properties to set to teach my code what the post types are and how they behave and what terms are used in them(Terms like Like, Reply, etc. tantek snarfed, indeed. I think laziness is underappreciated for efficiency. GWG I also want to map mf2 to WordPress properties, similar to what snarfed does. aaronpk i haven't had to experience that yet because I only post from quill ? Loqi [gRegor Morrill] @jdragz @girlvsplanet @indiana_mama That works for me. gRegorLove I'm thinking of just leaving out @-names in my original, let Twitter API handle it. aaronpk and that's via bridgy publish? [cleverdevil] aaronpk as I've been more heavily using Quill, I've noticed that some reposts and likes of Twitter URLs show up funky in Known (tracking HEAD). [cleverdevil] If you repost that link from Quill -> Known, it ends up pulling a bunch of stuff into the title (including some raw markup). [cleverdevil] Ah, sounds like a bug report for Known, then! gRegorLove snarfed: Sounds good. Is Bridgy using a different API version than silo.pub? [cleverdevil] !tell chrisaldrich I fixed those issues with my Watching plugin, I think. Thanks for testing it! Let me know if it works for you, and I'll close the ticket out. tantek snarfed, there's still something buggy in the overall way Bridgy Publish is POSSEing to twitter in that whatever it is doing (Twitter API, options etc.) results in prefixing with redundant @-names that are already in the reply. snarfed tantek: have you read https://github.com/snarfed/bridgy/issues/742#issuecomment-293411480 ? snarfed in particular, the new extended tweets changed the definition of "literal tweet text"
tantek snarfed this: "but my note is aimed at the general public and not just at the author of the tweet I'm replying to. " snarfed tantek: right. loqi is. silo.pub and falcon are using the old publishing API. bridgy is using the new one. tantek twitter users already know: "put @-mention at front of reply, only shows to people who follow both, put @-mention in middle of reply, shows to everyone that follows me"
snarfed i'll reiterate, bridgy publish is *not* adding explicit leading @-mentions itself any more. ever. snarfed it's not actually changing the intended audience! not in twitter itself, or in other current clients. snarfed look at the screenshot! that was the bug example, and it doesn't have leading @-mentions. snarfed ok. i think i understand what you're saying. snarfed so this isn't actually a recent change in bridgy publish. when bridgy publish sees a twitter u-in-reply-to, it interprets that as a reply. before, it would add leading @-mentions if they weren't already there, since twitter required them for a reply. now, it doesn't add them explicitly, but does tell twitter to make it a reply. snarfed ie, when you give bridgy publish a twitter reply, it's *always* limited audience in this way. that's not new. tantek by changing API calls, Bridgy broke the "...if it wasn't already in the text"
snarfed ahhhh i see. very good point. yes that actually sounds true. snarfed i honestly suspect this is bigger than bridgy though. if you replied on twitter.com before the new UX and got rid of the leading @-mention, it would change to public audience. now it won't. gRegorLove Yeah, there's no way to do a . @ reply now, to reply but also be visible on your profile. snarfed tantek: fwiw falcon and silo.pub only do what you want because they're using the old API. if twitter sticks with the changes, they'll eventually turn off the old API. snarfed tantek: do you have an example of a recent tweet that's a reply, but appears to the public audience? snarfed thx. would be helpful. snarfed and thanks for your patience explaining this point! gRegorLove Is https://aaronparecki.com/2017/04/04/10/ an example? tantek audience stuff is so subtle, and this is just dealing with public examples! tantek snarfed, no problem at all, thanks for your patience too! tantek gRegorLove: any example on aaronparecki.com would have to NOT start with "@"
GWG miklb: All the functionality changes are minor bug fixes and enhancements. Nothing spectacular. The big changes were refactoring to make changes easier. GWG The Retrieve stuff? Haven't gotten to it yet, but it will be in this branch. miklb ah ha! I reproduced it locally. snarfed filed https://github.com/snarfed/bridgy/issues/743 . thanks again tantek et al! miklb if anyone has a bullet proof nginx conf for WP with the wordpress files living in a subdirectory, I'd love to compare what I have. DeathInJune anyone knows a folk channel? tantek aaronpk you really should at least turn linebreaks into spaces instead of just dropping them in comments https://aaronparecki.com/2017/04/13/9/micropub-pr ? GWG miklb: I just made a change that might help your problem. tantek hey snarfed, while you're here, any chance of coming to IndieWeb Summit 2017-06-24…25? GWG I could meet snarfed? GWG tantek: I assume you've collected them all. tantek even funnier if we shuffled who got whose cards, so you had to trade even just to get your own! GWG I don't think anyone wants the GWG Rookie Card. GWG I just never thought I was very photogenic. GWG I really need to write more content. GWG I keep talking myself out of it. GWG tantek: I might try one. GWG If it works, then I probably will. I haven't tested it. GWG Anyone have the URL? GWG My feed reader isn't H-Feed compatible yet, and the developer scares me. GWG martymcguire[m]: You made me realize I don't have a setup for an audio post. GWG Of course, I just realized I didn't have video either, but...you are the reason I might want to have one. [eddie] https://files.slack.com/files-pri/T03QR2B2T-F4Z86EWFP/screenshot_2017-04-13_18.44.01.png?pub_secret=358884b5da&name=Screenshot 2017-04-13 18.44.01.png martymcguire[m] Sweet, the listen posts actually work pretty well falling back into just a normal mention with p-summary ? [chrisaldrich] KevinMarks++ for fighting the good fight ? Loqi [chrisaldrich]: [cleverdevil] left you a message 2 hours, 27 minutes ago: I fixed those issues with my Watching plugin, I think. Thanks for testing it! Let me know if it works for you, and I'll close the ticket out. [kevinmarks] The way you do a . @ reply now is to reply, then retweet your own post. miklb should rel=me links be in the h-card?